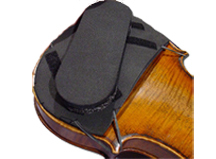 Created by Houston violinist Steven McMillan, the SureTone Rest provides a unique adjustability that other shoulder rests simply do not have. The SureTone shoulder rest features fully adjustable velcro sponges that adhere to a concave plate afixed to the back of the instrument. This shoulder rest is made to fit people of all sizes and shapes.